Monday August 25th, A pig gave birth to nine piglets on Saturday, and another to 8 on Sunday. Prayer request: Lord, let the piglets live. Help Luke in finding the right man to be in charge of the piggery. Wisdom for which direction to take with the piggery: produce piglets and sell them, or raise them to sell at full size for slaughtering. 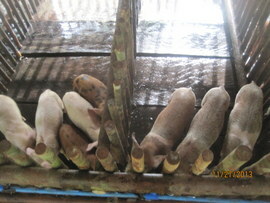 Lord, please provide buyers for the 26 piglets we have. 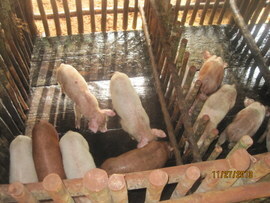 We need the money from the piglets to buy rice and pig food, and fuel, til the money wire comes at the end of the month. Thursday, August 28, 2014O Wow! God answers prayer!!! We have 2 healthy sets of piglets. Luke's planning to raise them for fattening to sell at full size. He had a meeting with the men on staff this morning, to discuss the situation with the piggery. 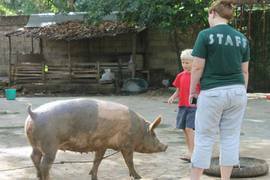 They divided the piggery duties into three shifts, with some mutual accountability, and the staff giving oversite to some others. So Luke is optimistic that the situation will improve. Luke has leads for buyers in several surrounding towns that he's trying to follow up on. Luke took 7 piglets to Santo Niňo yesterday. He sold 4 piglets and one pig roast size (approx. 65lbs). He was payed P9,500 (about $220). He quickly bought rice, pig food and fuel for the generator for 2 more days. Thiswas a huge answer to prayer. So far this month, we've sold 12 piglets. There are 14 more big piglets to sell, and 16 little ones just separated from their mother. Then there are 17 newborn suckling piglets. We need to sell some more pigs, to get rice, pig food, and fuel for 4 more days. Ps. 28:6-9: Blessed be the Lord, because He has heard the voice of my supplications! The Lord is my strength and my shield. My heart trusted in Him and I am helped. Therefore my heart greatly rejoices & with my song will I praise Him. Saturday, August 29th, 2014 Answered prayer: Luke loaded 11 piglets into the trailer today, and took them to Santo Nino, by faith, to look for buyers. He had no sure leads, or orders; but he ended up selling all of them. He was payed P25,000 (about $580), and had enough to purchase rice, feeds, and fuel through Tuesday, when he can send more.